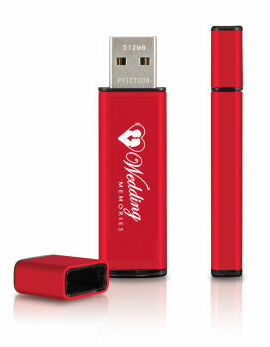 Thumb Flash Drives allow you to take your important information and personal data with you wherever you go. Store your digital photos, music files, business documents, and more on these ultra-portable, Hi-Speed USB 2.0 flash drives. Easily access and transfer files between multiple computers. Personalize one side with your logo and the other side with 2 lines of text. They are great for wedding albums, reunions, graduations, & all special events where pictures are made. Low minimum of 50 and no setup fee, ever! Choose from 14 popular colors shown below. Backup your important files or transfer files between computers with the speed of Hi-Speed USB 2.0. Flex Drives are also compatible with older USB 1.1 ports. and phone numbers of person to receive the drive. Makes a GREAT Gift for anyone that uses a computer. Ultra-small, compact design - lightweight, removable and rewritable. Store thousands of files in the palm of your hand! Rugged and durable, Our Jump Drive's aluminum body design helps safeguard your data. Jump Drives are compatible with both PC and Mac supporting Windows 98SE, Me, 2000, XP, Vista, Mac OS 9.x through Mac OS 10.4 (Tiger). USB Bus powered - There's no need for a power supply, Flex Drives are powered by your computer's USB port. Dimensions (W x L x H): 2.625" x .687" x .312"
Imprint Area (W x H): 1.5" x .5"
Call for quotes on larger quantity orders.